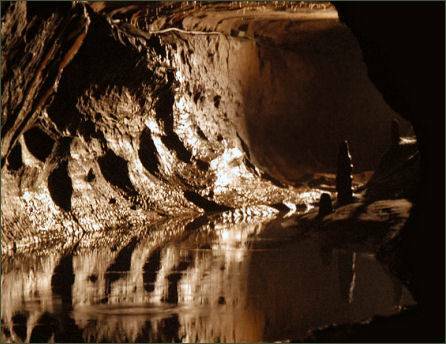 Ingleborough Show Cave is situated near to the village of Clapham in the Yorkshire Dales, adjacent to where the water from Gaping Gill re- emerges. 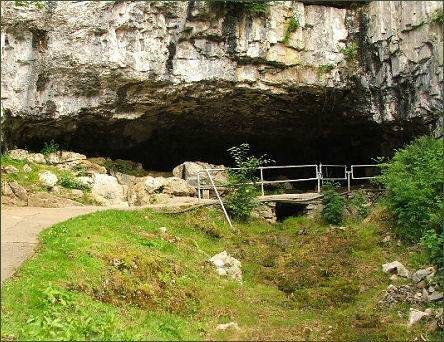 The cave, which was first entered and made accessible in 1837, is the premier show cave in the Yorkshire Dales. The part of the cave which is open to the public follows a fossil gallery for some 500 metres (1,640 feet) with an awe inspiring range of cave formations including many fascinating stalagmite formations. The imposing cave entrance and the large passages are full of artefacts dating back millions of years along with the evidence of the significant impact of the Ice Ages. Beyond the show cave, the fossil gallery continues until it meets the main stream. The water can be followed upstream through passages under Trow Gill, to where it emerges from a sump at Terminal Lake which has been connected by divers to Gaping Gill, and followed downstream into Lake Pluto which connects to Beck Head Stream Cave. A small stream in the show cave drops into a rift called the Abyss. An underwater connection has been made between the passage at the bottom and Beck Head Cave, the resurgence for the Gaping Gill water. The walk from Clapham Village to the Cave is also a unique experience. A leaflet is available at the start of the Trail which interprets the features of the walk through this woodland landscape with Himalayan plantings, unusual tree species and along a wide, well maintained gravel track.